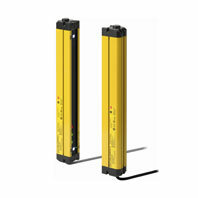 NOVEMBER 30, 2009 (ASIA PACIFIC) - Omron new robust F3SR-B Safety Light Curtain is easy-to-use and is ideal for long sensing distance. Omron new robust F3SR-B Safety Light Curtain is easy-to-use and is ideal for long sensing distance. With world's first large size, bright white LED, F3SR-B Safety light curtain can be easily align on large scale equipment installation. To aid user further, its easy-to-adjust mounting brackets allow for easy installation and maintenance. F3SR-B Safety light curtain also has built-in 3 intuitive indicators that enable user to understand the status at a glance thus further enhancing usability. Furthermore, with IP67 (water and oil resistance) compliance, this tough and reliable F3SR-B Safety light curtain is able to subject to impact in any severe work environment. Operating range up to 20m is one of the highest level standards among all safety light curtain and is suitable for large scale machine where long detection is required. F3SR-B Safety Light Curtain can be applied to safeguard any machines globally as it comply with the international standard IEC61496-1 for Type 4 Safety Light curtain and performance level ISO13849-1, PLe for safety system related components.